To continue the topic of tablet wars that was started on this blog, let’s take a closer look at the global tablet market in the third quarter of this year. According to the IDC Worldwide Tablet Tracker data, two leading Android tablet manufacturers represented by Samsung and Amazon gained a 27.4% cumulative share of the global tablet market (a 20.9% increase from Q3 2011), while Apple’s share shrunk to 50.4% (a 9.3% drop from Q3 2011). Q3 2012 was definitely a time for success for Samsung and Amazon tablets. Samsung, a long-term player in the field of the Android-based tablets, shipped 5.1 million tablets worldwide in 3Q12 and captured as much as 18.4% of the tablet market. This was a prominent 325.0% growth from 3Q11, when it shipped 1.2 million tablets. Samsung debuted in the US with its first 7-inch tablet, Samsung Galaxy Tab, back in November 2010, and sold 1 million of copies within the first two months, as reported by PC World. The latest generation model of the Samsung tablet, the Samsung Galaxy Note 10.1, was originally unveiled on February 27, 2012 at the Mobile World Congress in Barcelona, Spain. After a generous hardware update curated by the Samsung R&D center, this model was finally launched in the United States, the United Kingdom, and South Korea on August 16, 2012. Samsung Galaxy Note 10.1 came in 16GB, 32GB and 64GB versions and had a price tag starting at $499 (the pricing model similar to the third-gen iPad’s). Amazon, a new player in this field, announced a 7-inch Android-based tablet with a color touch screen on September 28, 2011. It was available for as little as $199; currently the price for the refreshed 7-inch version is $159. It was a bargain for those who could not afford a more expensive tablet and who didn’t require much from a tablet, e.g. a web camera, a larger screen, more storage, etc. The Kindle Fire HD was announced on September 6, 2012. It was the second generation of Amazon’s Kindle Fire tablet line available in two form factors, 7 inch and 8.9 inch. These two models, priced from $199 to $499, helped Amazon grow its worldwide market share from 4.8% in 2Q12 to 9.0% in 3Q12. In recent years, Apple started losing market share to Android tablets and this trend proved to be more prominent in Q3 2012. Last quarter Apple tablets captured a 50.4% global market share; it was a 9.3% drop from the same period last year when Apple’s share was 59.7%. In a chase for more sales and customers, Apple offered three new models this year. March 2012 was the time for the third-generation iPad release. The iPad 3 was offered for $499, the same price as the Samsung Galaxy Note 10.1. To compete in the fierce market flooded by the cheaper and spec-rich Android tablets, Apple, 7 months later, released a fourth-generation iPad with a faster A6X processor and a Lightning connector and offered it for $499. The ridiculous thing was that the iPad 4 was released so soon after the iPad 3 release, although Apple used to update its models once in a year. This fact might actually make the owners of the now “old” third-gen iPad feel a little bit… upset. There was one more iPad to hit the shelves in October 2012: the iPad mini. It had a 7.9-inch screen, 16G memory, and offered LTE cellular capability, starting at $329. The iPad mini didn’t have a Retina display; this step was obviously made by Apple in order to cut the costs and lower the price. Its retail price was still definitely above the same-form-factor tablets such as the Nexus 7, Amazon Kindle Fire HD and Nook HD, so we’ll see how it competes. Tablet Wars 2011-2012: iPads vs. Android Tablets. Facts and Forecasts. 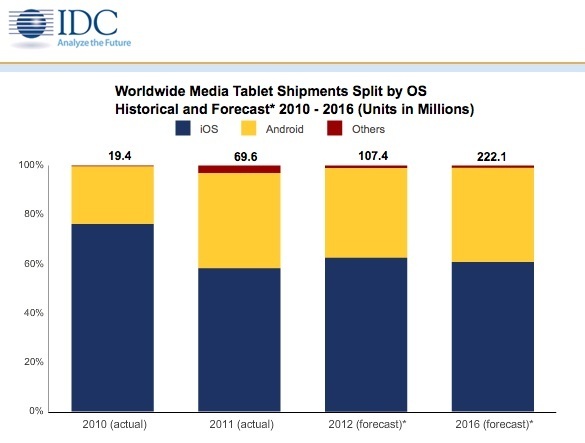 Media tablets have become a fast-growing market with great opportunities. In just a few years, tablets have entered our lives and redefined our attitude towards mobile communication and networking, gaming, online shopping and office productivity. There are currently two leading operating systems fighting for leadership of the global tablet market: iOS represented by Apple’s iPad devices and Android represented by a variety of vendors (Samsung, Amazon, Asus and others). 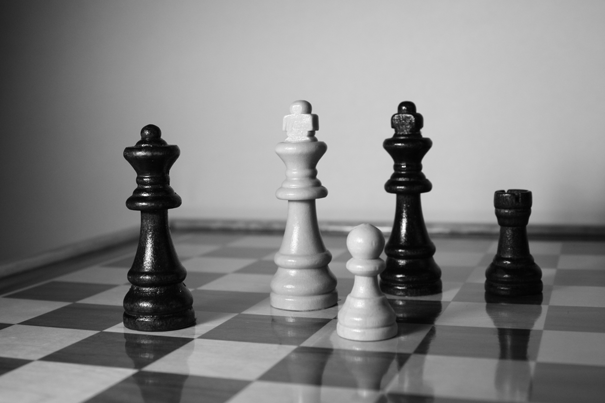 Let’s see how they have been stacking against each other from early 2011 through the first half of 2012. At the beginning of 2011, Apple products accounted for 65.7% of the global tablet market, while Android-based media tablets saw a collective market share of 34.0% (stats provided by IDC). As stated in IDC’s Press Release, worldwide media tablet shipments in the second quarter of 2011 were driven by continued demand for Apple’s iPad 2, which saw shipments reach 9.3 million units, representing a 68.3% share of the worldwide market. RIM’s PlayBook, introduced in the second quarter of 2011, took a 4.9% share of the market and made the Android-based media tablets slip to a 26.8% market share, down from 34.0% the previous quarter. According to the IDC report, Apple continued to drive worldwide media tablet shipments in Q3 2011. The company shipped 11.1 million units in 3Q 2011, up from 9.3 million units in Q2 2011. That represents a 61.5% worldwide market share (down from 68.3% in Q2 2011). HP both entered and exited the market in Q3 of 2011 with its $99 TouchPad product based on the Microsoft WebOS. The company shipped 903,354 units to grab a 5% share of the worldwide market, number three behind Samsung’s 5.6% market share (Android based). Barnes & Noble shipped 805,458 units of the Nook Color to achieve the number four spot with a 4.5% market share. ASUS rounded out the top five with a 4% share. As a result, the cumulative share of the Android-based devices slipped to 23% in Q3 2011. In Q4 2012, IDC reported that Apple suffered a market share loss mostly because of Android’s gain and Apple took only 54.7% of the global tablet market share. The reason was the swift introduction and rising popularity of Kindle Fire, a cheap $199 tablet offered by Amazon that gained a 16.8% market share. Samsung grew its market share from 5.5% in Q3 to 5.8% in Q4. RIM’s BlackBerry PlayBook saw its market share drop from 1.1% to 0.7%. WebOS, which controlled 5% of the market in Q3 2011 because of the HP TouchPad, dropped to zero % in Q4. As a result, in Q4 2011 the cumulative share of the Android-based devices reached 25.9% which came at the expense of Blackberry, iOS, and webOS devices. As IDC reported in another Press Release, Apple shipped 11.8 million iPads during Q1 2012 and grew its worldwide share to 68%, as opposed to 54.7% in the last quarter of 2011. Amazon’s Kindle Fire saw its share decline significantly in the first quarter to just over 4% from 16.8% in the previous quarter, falling to third place as a result. Samsung took advantage of Amazon’s weakness to regain the number two position. As reported by IDC and IHS iSuppli, Apple shipped 17 million iPads during Q2 2012 and covered 69.6% of the tablet market. Samsung experienced exceptional growth, and landed in second place with 9.2% share on 2.3 million tablet shipments. Amazon (Kindle Fire) and Asus took the third and fourth spots with 4.2% and 2.8% share, respectively. Note: The shipments of the Google/ASUS co-branded Nexus 7 aren’t reflected in these totals, as that product officially began shipping into the channel in the third quarter of 2012. As you see, Android is not going to give up, and we’ll keep an eye on the tablet market for you. If you are an Android fan and want to be productive with your email flow, try out the EmailTray email app for Android. Apart from being a lightweight email app with a user-friendly interface, it provides an intelligent email prioritizing feature that lets you focus on important mail and eliminates information overload.